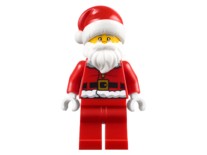 Santa Claus is a festive minifigure bringing Christmas cheer to other minifigures. Santa Claus is available in many Holiday LEGO sets, in fourteen different variations. The character appears in various video games and as a brick built figure, as well. Each of Santa's variations have a yellow head. All but one, wear a red bandana, which is tied in a low bow knot at the back. All of his variations up to his redesign also have a long white beard. The beard falls down his torso, it has a mustache and large sideburns moulded into it. Santa's first appearance was in 1995, in the set, 1807 Santa Claus and Sleigh. This variation includes a face with two black dotted eyes and a closed smile. He has an unprinted red torso, red arms, yellow hands and grey legs. Santa's second variation appeared in the sets, 1298 Basic Advent Calendar, 852119 Santa Magnet Set, 852753 Vintage Minifigure Collection Volume 4, 852742 LEGO Holiday Magnet. The variation included, a face with black eyes and closed smiling mouth. Santa has a long white beard, red torso, red arms, yellow hands and red legs with black hips. Santa's third variation appeared in 1076 Advent Calendar. This variation includes the face with black eyes and closed smiling mouth. Santa still wears red torso, red arms and yellow hands. His legs and hips are both red. Santa's fourth was in 1177 Santa's Truck. The outfit included the face with black eyes and closed smiling mouth, a red torso, red arms, yellow hands and red legs with white hips. Santa's fifth variation debuted and remained exclusive in the set, 7324 LEGO City Advent Calendar this variation includes red pirate hat, face with black eyes and closed smiling mouth, a red torso, red arms, yellow hands and dark grey legs. Santa's sixth variation was in 7904 City Advent Calendar. This was the first variation to include a face that wasn't the classic face with the closed smile and hollow eyes. Santa now has curved bright orange eyebrows over his eyes, with the right being slightly highered. Santa eyes are black, but contain small white pupils in the top right corner of each eye. Santa has an open smiling mouth, showing his white teeth. The mouth is decorated in orange facial hair. The variation is the first and only variant to contain a light bluish grey leg colour. Santa's torso, arms and hands remained unchanged, leaving them red, red and yellow. Santa's seventh variation appeared in 7687 City Advent Calendar. Santa's eyebrows are curved and are a dark red colour. This was the first and only pyiscal version to include glasses. Santa's glasses have white square shaped lenses, over his black eyes and pupils. The frame front and temples are left black. Santa's mouth is closed and smiling. The variation was the first to introduce a different hand colour other then yellow, white, which severed as his gloves. Santa's legs, arms and torso are plain and red. Santa had two appearances in 2010; Santa's eight variation was in 2824 City Advent Calendar, this version dispites him in the shower, this version includes red pirate hat, a smiling face, long white beard, yellow torso, yellow arms, yellow hands and yellow legs with black hips. Santa's ninth variation was also in 2824 City Advent Calendar, this version includes red pirate hat, a smiling face with black glasses, long white beard, a red torso, red arms, yellow hands and red legs. Santa had three appearances in 2011; Santa's tenth variation was in 853353 Holiday Magnet, this version includes red pirate hat, a smiling face with freckles, long white beard, red torso, red arms, yellow hands and red legs. Santa's eleventh variation was in 7553 City Advent Calendar, this version includes red pirate hat, a smiling face, long white beard, red torso, red arms, yellow hands and grey legs. Santa's twelfth variation, was in 3300002 Holiday Set 2 of 2 ,this version includes red pirate hat, a smiling face with a white beard, a long white beard, red torso, red arms, yellow hands and grey legs. 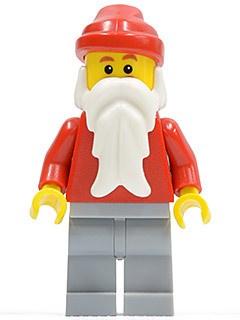 Santa's fourteenth variation debuted in 8833 Minifigures Series 8, which allowed new face and torso prints, along with a newly moulded hat and beard. The set had no elements from the previous variations, apart from his legs and arms being white and his hands being white. he has the classic Santa hand with a white bobble and white ruff, a smiling face with a white beard, a short white beard, a red torso which has a coat printed on it with white ruff outlining and a black and gold belt, he has red arms and white hands and red legs, he carries a brown sack for an accessory. Santa makes appearances in 4850307 LEGO Battles and LEGO Battles: Ninjago. His appearance in both of these games are just a pixilated version of his second variation. Santa Claus is a jolly old man who lives in a workshop, at the North Pole. Each year he receives Christmas letters from children around the world. He reads the letters and then decides wether the children are naughty or nice. If the children are nice, the elves create gifts for them, occasionally they wrap them. Santa places all the gifts into his bottomless sacks. On December 24, Santa travels around the world in his magical sleigh pulled by reindeer. He accesses each house, by the chimney and leaves presents them under the brightly decorated tree. He makes sure he delivers all the presents before Christmas morning. Santa is married to Mrs. Claus, who feeds him baked goods and candy canes. Santa also likes drinking hot coca and coffee. During the summer months, Santa goes on vacations to warm countries, such as Fiji. 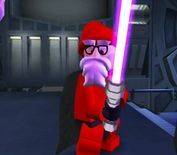 Santa has appeared in five video games; 4850307 LEGO Battles, LEGO Battles: Ninjago, LEGO Indiana Jones: The Original Adventures, LEGO Indiana Jones 2: The Adventure Continues and LEGO Star Wars II: The Original Trilogy he plays no role in these games, but is an unlockable character. In 4850307 LEGO Battles he is unlockable at 100% completion of the game, in LEGO Indiana Jones: The Original Adventures and LEGO Indiana Jones 2: The Adventure Continues he can be found on level 2 in the house. In LEGO Star Wars II: The Original Trilogy he can be built in the character creator with a cheat code. He can be unlocked in the LEGO Battles and LEGO Battles: Ninjago video games by playing on Christmas Eve and Christmas Day respectively. He can also be unlocked if the console's date is changed to one of these days. He is also playable in the Consoles and DS version of LEGO Indiana Jones: The Original Adventures and the DS version of LEGO Indiana Jones 2: The Adventure Continues, with his weapon being a giant candy cane. Santa also appears in CrystAlien Conflict as a unit who has accidentally crash-landed on Mars during the bonus level, when you type "SANTA" as a password. He is seen riding a snowboard and wielding a blaster. Santa only delivers presents to children on Earth, so he asked Yoda, Darth Maul, Jango Fett, Darth Vader, and C-3PO to deliver presents around the Star Wars galaxy for him. This page was last edited on 5 September 2017, at 00:43.